Highly prolific during her short life, Cuban artist, Ana Mendieta left behind an extraordinary body of work including her beautiful Siluetas – a series of earth-body sculptures where she imprinted or outlined her silhouette into or onto the natural elements. Hauntingly foreboding in their gesture, these works recall sites of mourning and the tracings of a body long after its death. Mendieta’s name is unfamiliar to most people, and until recently, her work has lurked in the shadows of a white male-dominated art world and her mysterious death. In 1985, Mendieta married Carl Andre, a minimalist sculptor and one of the darlings of the New York art scene. Well-known for their public quarrels while intoxicated, the couple’s relationship remained contentious until its tragic conclusion eight months later. In the early hours of September 8, 1985, Mendieta somehow “went out the window” of their 34th-floor Greenwich Village apartment wearing only her underwear. There were no eyewitnesses. A door attendant in the street below heard a woman screaming “No, no, no, no,” then the explosive thud of her body as it landed on the roof of the Delion delicatessen. When officers arrived at the scene, the bedroom from which she plunged was in disarray, and Andre had fresh scratches on his nose and forearms. His story to the police differed from his recorded statements during the 911 call hours earlier. He was recorded as saying, “What happened was we had…my wife is an artist…and we had a quarrel about the fact that I was more, uh, exposed to the public than she was, and she went to the bedroom and I went after her and she went out the window.” However, Andre later told police that he and his wife had been watching television before she went to bed alone. Upon going to bed later, he found her gone and the bedroom window open. Mendieta weighed only 93 pounds in contrast to Andre at 175. She also stood less than 5 feet tall and it was difficult for police officers to reconcile how she could have accidently fallen out of a very high window. Andre’s lawyer attributed her death to a possible accident or suicide, however, neither of the scenarios added up, which is likely the reason the police sought murder charges, and why many of her friends and colleagues still remain unconvinced of his innocence. With such contradictory evidence and anecdotal accounts, the cause of Mendieta’s fall remains a matter of conjecture. How could someone with a show about to open at the New Museum (in a twisted irony her exhibition opened a few days prior to Andre’s trial) commit suicide? How could someone who was so afraid of heights get up high enough to accidentally fall out a window? Those who have curated or were close to Mendieta, believe that her art deserves to be studied and celebrated away from the circumstances of her death. 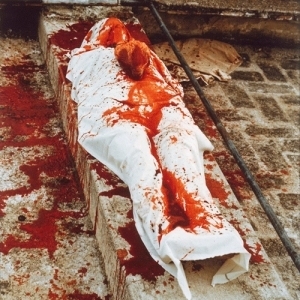 Most disturbingly (although not surprisingly), the defense used the provocative imagery of her work – the violence, ritualistic performances and allusions to death – to argue that this was the proof that Mendieta wrangled with her identity and had an obsession with death. However, artist Dotty Attie, recalls that her close friend had expressed excitement and optimism about the direction of her art, and her new plans were to give up drinking and smoking. Apparently, because women artists rarely gain recognition until they are old, Mendieta expressed a desire to live long enough to savour this future moment. Yet, mysteriously, this visionary artist, often described as a passionate, ambitious and fiercely independent woman with a survivalist spirit, died at a pivotal arc in her artistic career. Andre was finally arrested, and charged with second-degree murder. After a three-year legal struggle, his indictment culminated in a trial by a judge rather than by a jury, a rarity in US murder cases. Much of the evidence, suppressed due to sloppy police and prosecutorial work, ultimately led to Andre’s acquittal in 1988. On the request of his lawyer, the records were permanently sealed. Why? In the eyes of many, the manner in which Mendieta fell to her death has never been settled. Schneemann views her death “as part of some larger denial of the feminine.” Oddly, Andre, who has rarely spoken about Mendieta’s tragic death since it happened, has continued to live in the same apartment where she plunged to her death along with his fourth wife, artist Melissa Kretschmer, who in the most eerie of twists makes window-based artworks. The intrigue and mystery surrounding Mendieta’s death deeply polarized the art world between the powerful establishment loyal to Andre and the feminist and Latino art communities. Her death triggered a public outcry and an army of female artists like the infamous Gorilla Girls who began to assert their voices against discrimination and misogyny inside and outside the art world. The story of Ana Mendieta is also the document of a fertile era in Feminist Art of which she became a pivotal figure. However, only recently, has her work received the critical attention it deserves. Despite the inclusion of women and people of color in the intellectual world of academia, the art world remains frozen in the sixties, denying the majority of female artists entry into a closed system. What caused Ana Mendiata’s fatal fall will likely always be shrouded in a mystery, and the screaming echo of her protests, “no, no”, may continue to divide the art world as it reverberates within the dark and ritualistic imagery of her remarkable art works. I would love to read your comments — please write your thoughts in the box below. Thank you! Nadia, the Afghan poetess who was becoming quite famous for her brave outspokenness and beautifully touching words, was murdered by her husband in 2007. He had constantly complained about the fact that she was known and he was not. Before murdering her he had frequently stated that it was not proper in Afghanistan for a wife to be more esteemed than her husband, so it is understandable that, considering the cultural ramifications, the obvious solution to this indignity was to kill her. A strange incident came back to my mind from observing the interview. The year was 1985 and my wife at the time told me that she had heard a strange noise in the next room, that it sounded like someone might have broken into the loft we lived in and would I check and see? I did and she was right, an intruder was standing in the middle of the room. “May I ask what you are doing here?” “Isn’t this an art gallery?” he responded in a relatively polite tone. “No, it isn’t. How on earth did you get in here? You would have to go through three locked doors!” I don’t remember his reply but he maintained his well-mannered tone so in an equally polite tone I asked him to take a seat on the futon sofa that he was standing in front of. He hesitated for a moment but acquiesced to my politely insistent gesture as I gently but firmly pointed to the sofa. I had all the while been talking to my assistant, Judith Odell, on my wireless phone so he realized that another person was also aware of his intrusion. “I’m sure that it’s an innocent mistake but if you don’t mind sir, I’d like the police to interview you just to be certain. Is that all right?” He said that it was. “ Judith would you please call 911 and send the police to interview what is probably just a mistake?” After I chatted with the fellow a bit more my suspicions became heightened and I myself dialed 911 as well. At that point the young intruder started to get up but I said no, no, I’m sure that it’s all right but please sit back down, they will be here momentarily. And this he did. When the police arrived they found he had a very sharp mat cutter and some file keys in his pocket that the fellow had taken from a hook on my wall and told me that I was lucky that he hadn’t slit my throat. Off they went and I heard no further about it until I received a phone call from a lady who said that she was an assistant District Attorney and that my intruder had seemed so harmless that they were about to let him go until they discovered that he was wanted for an earlier burglary charge as well and would I be so good as to come down to the Grand Jury that was considering whether to prosecute the case and describe the details of the intrusion? As I arrived at her office and she realized that I was a part of the New York art world, she expressed her frustration about a second case that that she had been appointed to pursue. A famous sculptor had obviously murdered his wife by throwing her out of the window of their thirty-fourth floor apartment, the concierge had actually heard the victim scream, “ No, no, stop! Don’t!” just before she hit the pavement but the entire New York art world had shut up like a clam and no one would allow himself to be interviewed as to the character of the culprit. She further mentioned that she had heard rumors that the husband had an extremely bad temper and had even beaten up his ex-girlfriend who, as well as having been his girlfriend, had also been his art dealer. But the dealer, Paula Cooper, had, as had all the others, refused to be interviewed. I myself had never met Carl Andre, the husband so I also was of no help. Nevertheless, she was determined to pursue the case so eventually it went to trial but the husband was judged to be innocent of the crime. My landlord was a friendly Sicilian guy and introduced me to a number of his interesting friends telling them that they would enjoy hearing some of the strange stories about art that I had to tell. One day while I was having lunch with one of his friends in the lovely outdoor backyard patio of Barolo restaurant just down the street from my gallery, I decided to tell him the outline of the crime story that I have so far related. Today I Googled the name of the murdered wife and this is what I found. It was said by some in the art world that shortly before her death, Ana Mendieta was on the verge of becoming more esteemed than her husband. Thank you for writing such a fascinating and beautiful post. It has always bothered me that the court documents to this day remain sealed. Sadly, it would not surprise me that a judge had been bribed and that Frank Stella paid the bribe to hide the truth. Even today the art world is still a man’s world. I didn’t realize that the judge was able to keep the testimony of the concierge out due to a technicality. Do you happen to know what the technicality was? Would be very curious to know. To find the technicality that I referred to in my Anna Mendieta story, look up name of the initial defense lawyer, his first name is Jerry and he was also Leo Castelli’s lawyer at the time and if he is still alive, he will be able to candidly answer your question and give you more info on the matter. Thank you for the tip Muldoon. Now I remember the lawyer’s full name. It is Jerry Ordover. Another interesting story that Jerry told me was that a woman who bought an fabulous original Picasso lithograph from me in the 1980s hired him because Pisasso’s son Claude had told her that the lithograph (numbered 00/000) had to be a fake because there was no such numbering but when Jerry researched it he discovered that Claude was totally wrong and that the lithograph was indeed genuine. Ironically, now the auction houses use Claude to authenticate his father’s work. The estate also tried to hush up the documented fact that Picasso’s mistress painted part of his most famous painting, “Guernica.” (Pronounced gwer-‘NEE-ca). You also probably know that Pacasso’s real name was Pablo Ruiz but Ruiz in Spain was like Smith in England and the U.S. so Picasso decided use his mother’s name and to stop signing his work as by P. Ruiz. Great pot and information. Thanks! Reflections on the flotsam and jetsam of modern life. And other stuff.